Features general principles of first aid for marine-acquired injuries, the bacteriology of the aquatic environment and its implications for treatment, and principles of antivenin administration. Dr. Auerbach reviews the treatment of traumatic injuries from marine animals such as sharks, barracudas, moray eels, and sea lions as well as envenomating marine animals such as sponges, coelenterates, mollusks, and stingrays. Outlines the principles of medical treatment for large wild animal attacks, focusing primarily on animals found in North America. Dr. Freer and Dr. Conrad review the mechanisms of injury, prehospital and hospital treatment for attacks, and prevention and defense tactics for wilderness travelers. Covers the epidemiology of accidental hypothermia, the physiology of temperature regulation and the pathophysiology of hypothermia. Dr. Danzl reviews the prehospital and hospital management of hypothermic victims with and in-depth analysis of the various rewarming methods. Additionally, methods of prevention and predictors of outcome are discussed. Explores phototrauma and dermatitis secondary to toxicodendrons (poison oak, ivy, and sumac) in two separate sections: Part 1) Phototrauma; Part 2) Poison Oak/Ivy/and Sumac Dermatitis. In Part 1 ultraviolet radiation and its effects on human skin are reviewed. Dr. Kaplan discusses the latest advances in sunscreens and reviews sunburn treatments. Part 2 instructs how to identify poison oak, ivy, and sumac plants. The clinical presentation, treatment, and prevention of dermatitis associated with these plants are also included. Simplifies diagnosis and treatment of common eye conditions encountered in the wilderness setting. Dr. Ferguson organized the presentation on an anatomical basis. The external disease section focuses on trauma, infections, and inflammatory conditions of the orbital bones, lids, and ocular adnexa. The second section contains information on pathology of the globe, subdivided into sections on trauma, infections, inflammations, ischemic injuries, and toxicity of systemic and topical drugs. FAQs commonly encountered by health care practitioners are presented and discussed. Explores the injuries that can be sustained due to submersion: drowning and near-drowning. Submersion injury risk factors are discussed (age, gender, preexisting conditions, swimming ability), as well as the pathophysiology of submersion, various injuries, and field and hospital treatment. Covers the general principles of enteric infections and takes an in-depth look at the two major diseases afflicting foreign and wilderness travelers: traveler's diarrhea and giardiasis. Covers the gamut of survival in many situations and why “luck” isn’t enough: preparation, clothing, medical and emergency kits, and heat loss and gain. Mr. Kummerfeldt explains how to develop a plan for survival before you have a need for it: what to carry in your pack, how to orient yourself, how to build different kinds of shelters for various weather conditions, mental and spiritual preparation, emergency fire starting, rescue signaling, and so much more. Features medical conditions associated with diving and a summary of diving illnesses: various forms of barotrauma (middle ear, sinus, pulmonary, gastrointestinal, etc.) and embolisms and their clinical presentation, treatment, and prevention. Also included is a thorough discussion of diving sickness, nitrogen narcosis, oxygen toxicity and co-toxicity, breathing gases at an elevated pressure, diving charts and diving physics. Includes the etiology and epidemiology of waterborne illnesses and water disinfection methods to assure safe, potable water. Methods illustrated and discussed include: heat, sedimentation, coagulation-flocculation, and granular disinfection. The epidemiology, pathophysiology and classification of frostbite injuries and the normal physiological response to cold. Drs. Zafren, O'Malley, and Mills review the symptoms and signs of frostbite and then describe in detail the prehospital, emergency department, and hospital treatment. Other types of cold injuries, such as immersion foot and chilblains, conclude the presentation. Discusses the effects of altitude on the human body and the physiologic changes that result in acclimatization to altitude stress. The pathophysiology, clinical presentation, and treatment of acute mountain sickness, high altitude cerebral edema and high altitude pulmonary edema are presented in up-to-date detail. Drs. Zafren and Hackett review the effects of altitude on preexisting medical conditions and make recommendations regarding travel to altitude for persons with these conditions. Discusses and identifies various arthropods species (spiders, scorpions, bees, wasps, ants, and centipedes). The authors cover bites vs stings, human illnesses caused by arthropods and their management and treatment. The presentation explodes common myths and discusses fatalities. The many vibrant slides provide superb identification of the various species. Identifies venomous U.S. snakes and the symptoms and signs of envenomation. Dr. Norris also presents the management of pitviper and coral snake envenomations from first aid in the field through treatment in the hospital. The presentation closes with a brief review of the identification and management of exotic snake envenomations. Covers the latest lightning facts and figures and explores and explodes the many myths surrounding lightning and lightning injuries. Bennett and Olson present the current epidemiology, the various mechanisms of injury, and detail the pathophysiology on the body and neurological systems, as well as the management of lightning strike injuries. An extended section on the prevention of lightning injures and safety precautions and devices concludes the presentation. Provides thorough epidemiology of heat illness and hyponatremia, warning signs and symptoms and the principles of therapy for treating heat-related illnesses, as well as prevention. Case study scenarios and discussion conclude the presentation. This completely revised lecture covers the commons orthopedic injuries encountered in the wilderness. Included in the discussion are dislocations of the shoulder, elbow, finger, hip patella, and ankle, and fractures of the upper and lower extremities and pelvis. Management of these injuries in remote settings is described with emphasis on practical reduction and splinting techniques using available resources. Biodiversity can be defined as the variety of all life forms that inhabit the Earth. The loss of species diversity on our planet is occurring at a rate that is 1,000 to 10,000 times greater than the natural background rate. This all new portion of the WMS Educational Lecture Series is intended to increase awareness of the impacts of biodiversity loss on human health and to assist in the development of an action plan that will provide a path towards environmental sustainability. This presentation focuses on health and safety of shipmates by addressing the 'Fearsome Five:' Food, Fluid, Fahrenheit, Fatigue and Fitness. Neglecting any of these five areas can lead to illness, injury, and loss of optimal physical and mental performance. The most common injuries, their avoidance and treatment are also discussed. This discussion and presentation covers the most common tick-borne illnesses: Lyme disease, Rocky Mountain spotted fever, Ehrlichiosis, babesiosis, and tick paralysis. 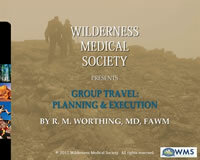 The OB/GYN educational presentation reviews common obstetrical and gynecological problems, discusses management in remote setting or wilderness setting.